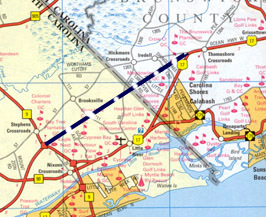 NCDOT and SCDOT held joint public workshops on this Carolina Bays Parkway connector proposal in Ash, NC and Little River, SC in February 2004.3 On February 11, 2005 SC and NC agreed upon a deal whereby North Carolina would build I-73 from the US 74 freeway near Hamlet, NC to the SC border in exchange for SC to finance building a 5-mile extension of the Carolina Bays Parkway from SC 9 to the NC border. NCDOT would then build a new 3 to 4 mile freeway from US 17 to the border to tie into SC's extended Parkway, all of which would then be designated I-74 (or a spur of I-74).4 (All of this I-74 segment would have been tolled under a later proposal that was studied, and then rejected, by the North Carolina Turnpike Authority, for more details see the I-74 Segment 18 Page). After more than a decade of inactivity, NCDOT announced in June 2016 that an engineering firm had been hired to complete the environmental study of the North Carolina portion of the proposed route corridor. NCDOT indicated that after the study is complete, a final decision will be made to go ahead with construction, estimated to cost between $202 and $280 million.5 This action seems to be in response to renewed interest from South Carolina in early 2016, when money was obtained for renewed project development and environmental studies, though not for any right-of-way acquisition or construction. Back in 2005, NCDOT started work on a feasibility study for the Parkway extension in NC. (For a link to the study, go to NCDOT's Carolina Bays Parkway Extension website). At a meeting on October 11, 2005 in Shallotte the public was invited to comment on six alternative corridors for the CBPE. The response was overwhelmingly negative to most of the proposed alternatives, four of which would take out the landscaped entrance to the Brunswick Plantation. Public input was to be used to narrow the choice to three alternatives, though no subsequent announcement was made public, probably due to the money for the study running out at the end of 2006 (see below).7 The feasibility study was given a number, FS-0303A in the Draft 2007-2013 STIP,8 but was dropped from the final document. No funded projects have appeared in STIP documents through 2016. Therefore, it is still unclear when this highway would be signed as I-74 (or perhaps an I-74 spur) since its contingent on the upgrading of much of US 74 east of I-95, building a connecting freeway between US 74/76 and US 17, and/or bringing US 17 south of Wilmington up to interstate standards, projects currently neither funded nor listed in the 2016-2025 State Transportation Improvement Plan. (1) WRAL TV. 2003. "Easley Announces Strategic Transportation Plan" Downloaded from http://www.wral.com/traffic/2180629/detail.html, May 5, 2003. (2) NCDOT. 2016. Carolina Bays Parkway Extension Project Site. Downloaded from: http://www.ncdot.gov/projects/CBP/, 3/11/16. (3) NCDOT. 2004. NCDOT and SCDOT to Hold Workshops on Proposed Extension of Carolina Bays Parkway in Brunswick County (Press Release). Feb. 5. Downloaded from http://www.ncdot.org/news/carolinabay02_04.html, Feb. 15. (4) Wilson, Zane. 2005. "Carolinas Reach Interstate Deal." The Sun News (Myrtle Beach, SC). February 12. (5) Sullivan, Courtney. 2016. "Remember the Carolina Bays Parkway Extension? It Might Be Back." Wilmington Star-News Online. July 11. Downloaded from: http://www.starnewsonline.com/news/20160711/remember-carolina-bays-parkway-extension-it-might-be-back, 7/17/16. (6) Holland, Makenzie. 2017. "The N.C. and S.C. Departments of Transportation Have Begun Studying the Carolina Bays Parkway Extension." Star-News (Wilmington, NC). September 13. Downloaded from: http://www.starnewsonline.com/news/20170913/carolina-bays-parkway-extension-study-begins, 9/14/17. (7) Jones, Steve. 2005. "Public Get Personal in Scrutiny of 6 Highway Routes." The Sun News (Myrtle Beach, SC). October 12. (8) NCDOT. 2006. State Transportation Improvement Program, Draft, 2007-2013, Division 3, p. 3-6. (9) Ross, A.J. 2009. "Little River Calls for New Road Project." WMBF News.com. September 23. Downloaded from: http://www.wmbfnews.com/ Global/story.asp?S=11171869, 9/23/09. (10) NCDOT. June 2008. State Transportation Improvement Program, 2009-2015, Division 3, p. 3-10. (11) NCDOT. 2018. Carolina Bays Parkway Extension. Downloaded from: https://ncdot.publicinput.com/2518/?fbclid=IwAR0gocuKW-R4azsTOPpgybpxyiVLR8Gel5I4pACMI2Vi3CjJaVSaUiKWtlQ, Dec. 21, 2018. (12) NCDOT. 2019. State Transportation Improvement Program, 2020 to 2029, Draft. January 10. Division 3, p. 1 of 51. I-74 shields courtesy of David R. Kendrick's Shields Up!